1. I wonder if Wally Backman might be the choice at second over Alfonso. Depends how much you weight the sentiment of the ’86 championship, I guess. Same thing with the relief slot. John Franco was pretty good for a pretty long time, but does that outweigh Tug McGraw’s ’72 and (especially) ’73 seasons and that whole “Ya Gotta Believe” business? Not being a Mets fan, I don’t know the answer to that question. I am pretty sure I’d take Dwight Gooden over Jerry Koosman, though. The light that burns the brightest, and all that. 2. 1 : Thanks for the thoughts, Philip. I think since neither Backman nor Alfonso had a really long career with the Mets, Alfonso’s status as one of the two or three most important players on the 2000 pennant-winning team gives him the edge over Backman, who though an excellent table-setter against righties was a platoon player (with Tim Teufel) in ’86. (I also thought Felix Milan rated some mention at second base). 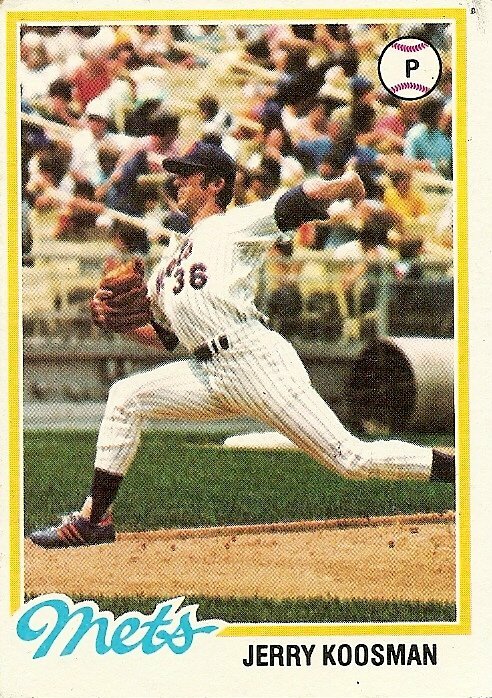 I picked Koosman because I (somewhat arbitrarily) wanted my all-time teams to have both a lefty and a righty starter. So in that sense Gooden has to get behind Seaver. McGraw was a really tough guy to leave off the list. 3. Except that Gooden was right-handed, so he’d be replacing Tom Terrific, not the Kooz. I’d go with Tug McGraw, too. My favorite media nod to Seaver and Koosman was on Growing Pains, where the Seaver family’s next door neighbor was Bud Koosman. 5. 4 As Ken Arneson put it, in one of the most brilliant pieces ever posted on the Toaster: Remember the beer. Franco may have done more, and for a longer period of time, but McGraw is the All-Star. And having said that, I’ll argue a somewhat contrary position: Jose Reyes, even playing at his usual 75%, is still a way better ballplayer than Bud Harrelson. I guess longevity and 1969 might put Harrelson over the top – along with the beer, though Bud’s not close to Tug on that score. But if Hrrrelson’s on the team now, he won’t be for all that much longer. 6. Now that I look him up, Franco was with the Mets for a lot longer than I remembered, so that’s a point in his favor. Part of the problem I also have is the image of him getting constantly booed by the Shea faithful in his last couple of years. Tug was traded from the Mets in his prime. They aren’t that different statistically other than saves, but part of that is different eras. 7. 5 – Buddy also started a brawl with Pete Rose, so there’s that. 8. Tommy Agee in CF gave me the best memories of the 69 series. 9. 7 I actually thought of that as a point in Harrelson’s favor. Anyone who starts a fight with Pete Rose is OK in my book, except maybe if it’s Gary Sheffield. 10. I have to go with Gary Carter at catcher. Piazza had the better career but much of it came with the Dodgers. 1. Players with great careers, or great single seasons? 2. Great careers/seasons with the team in question, or can we also consider accomplishments elsewhere? 3. Does longevity with a given team count for something in and of itself? 4. Based purely on talent/achievements, or also contributions to winning? And are the contributions only on the field (ie clutch performances) or also “intangibles”? Hate to be the kid who raises annoying questions about the assignment (“When you say ten pages, is that double-spaced?”) but some guidance would help. Or you could let the alternative views bloom too if you prefer, in the spirit of the argument itself being fun. 12. 5 : Yeah, Reyes should pass Harrelson soon. If he hadn’t been playing the last few months in a fog he’d already have passed him. 10 : What you say about Piazza and the Dodgers is true, but you could say the same about Carter and the Expos. After his many all-star seasons with the Expos he had one great season with the Mets (’85), one good season (’86), and then started losing it pretty quickly. After that he was cooked (1989, his last season with the Mets, he batted .183 with 2 home runs in 153 at-bats). 13. 11 : Great questions all. Thanks for asking them. 1. Great careers weigh heavier than single seasons, but the legendary season (such as Dr. K’s 1985 campaign) has to count for something. If two guys had similar or even close to similar careers, give it to the guy who had the higher career climax, I guess. 2. I’d say the focus should be mostly, if not entirely, on their work with the team in question. 3. I think longevity does count for something in and of itself. It’s why Ed Krranepool HAS to be on the all-time Mets team, for example. There are plenty of other worthy “wild card” candidates, such as, off the top of my head, Rusty Staub, Lenny Dykstra, and–personal favorite–Mackey Sasser, but none top Kranepool’s eminence as an Original and long-lasting Met. On the other hand, longevity alone isn’t a clincher–it’s not enough, for example, to give Kranepool the first base spot over Keith Hernandez. 4. I have to leave the intangibles vs. numbers quandary up to everyone to decide for themselves. I think my own choice of Franco over McGraw leans towards the numbers, but my personal feeling is actually that an all-time franchise team should also reflect certain hard-to-define emotional connections of the fanbase. And as we’re already seeing from the comments, the best way to make that connection is to be lucky enough (as John Franco never was) to be a member of a World Series-winning team. I certainly can’t argue with someone who wants to give a player a little more credit for being on a team that won it all. 14. Seems to me that on offense, the Mets are an all-intangibles team. Their two legitimate offensive stars, Piazza and Strawberry, loom nowhere near as large as lesser but more memorable players like Hunt, Agee, Jones, Weis, Grote, Harrelson, Wilson, Backman, Johnson, Dykstra, Zeile. That’s why they’re so hard to love now. Ho-hum, they signed Beltran, they signed Delgado. The Mets of old would’ve missed those guys and picked players from the scrapheap, mostly failing, but occasionally coming through, with the help of their signature great pitching. 15. Will there be a spot for DH on AL teams, or will DHs have to sneak their way into the wild card position? 16. 13 To me, Kranepool’s primary qualification isn’t really longevity, not quite. He was…quintessential. Longevity was a part of that, but only a part. 17. 14 : Yeah, the Mets’ top two candidates for all-time defining moments are not dramatic home run blasts by Hall of Famers but the shoe-polish play in ’69 and the Mookie Wilson grounder in ’86, flukey plays that the “intangible”-laden Mets scrappily capitalized on. 15 : Good question about the DH. (I wonder if you, a fellow Sox fan, ask because you might be wondering, as I have for most of my life, how to get both Ted Williams and Yaz on the same all-time Red Sox squad [or if you put Yaz at first instead of Jimmy Foxx how to get Manny or maybe Jim Ed in there]). But I’m kind of leaning away from the DH, since most A.L. teams spent more years without it than with it. 16 : Yes, well put. 18. One thing you can already tell about these lists is that a lot of great pitchers are going to be omitted. SS – Jose Reyes – He’s now in his sixth year with the team, and is three times the player Harrelson ever was. RP – Tug McGraw — Contrary to what one might think, he actually pitched more for the Mets than Franco did (793 innings vs. 703). Wild Card – Dwight Gooden. 19. 9 – Oh, I do, too. I didn’t mean to imply that punching Rose was a bad thing. 20. He didn’t really have a position, but Howard Johnson had several fine seasons. He was less emblematic a Met than Harrelson, and nowhere near the fielder, but he was a better hitter than half the guys on the list. 21. 18 : Good point about how this sets up to leave out a lot of pitchers. Maybe we could make a starting rotation. And seeing McGraw’s innings pitched is eye-opening. But then again I think he racked up a lot of those innings as an inconsistent starter, so I’m still not convinced. I’m willing to follow your lead on Reyes though. But Kranepool must stand! 20 : I had Hojo ranked second at third base and third at shortstop. He’d definitely make the 25-man team. 1. This is a 1978 card, so it has a “Play Ball” gamepiece on the back (I added a link at the end of the post). 23. 21 : Never mind my idea that McGraw racked up “a lot” of innings as a starter. I actually looked, which I should have done in the first place, and he was only primarily a starter in ’66 (12 of 15 games) and ’67 (4 of 4 games) (he did poorly both seasons); otherwise he seems to have been a very occasional spot starter. I’m still on the fence. 24. How about a space for bench coach and manager? For the Mets, the coach would have to be Marv Throneberry (if Kranepool, why not Marv!?) and the manager should be Gil Hodges, I’d think. 25. Throneberry deserves a spot just for being the only Met whose initials were M.E.T. 26. 24 No love for Davey Johnson? 27. 17 As a White Sox fan, we need the DH desperately. 28. The Mets’ everyday players are just so rotten it’s very tempting to say Beltran over Mookie and Reyes over Harrelson right now. Alfonzo is the right call over Backman. Their best CFer ever was Amos Otis, but they didn’t realize it. No way on Franco. He had a nice career and all but I’d probably put him behind McGraw, Orosco, and even McDowell & Benitez. Hojo for DH, Hodges manages with Valentine and Johnson on the coaching lines. The Kooz was initially a power pitcher who adjusted to become a wily curveball artist after arm soreness. Kranepool was DFA’ed in midseason, 1970 and could have been claimed by anyone… but wasn’t. He then began to re-invent himself as a pinch-hitter and had another 9 years with the Mets. Still leads the team in total bases, doubles and a few other offensive categories. 28 : I defer to your expertise on the “No way on Franco” but ranking him below Benitez seems, on a gut level (I’m not checking the numbers but just remembering my Met friends’ wailing about Benitez), unfair. Franco was really that bad? I guess I always had a soft spot for him since on our way to Mets games we’d always see at least 25 uniformed members of the NYPD who looked exactly like him. 30. No, it wasn’t that Franco was that bad… he wasn’t, he was quite good…. it was that Benitez was much better than he ever got credit for being (Met fans will kill you for saying it, but it’s true). I suppose I’m going with Benitez on a “peak value” kind of basis here, but he took Franco’s job for a reason. The thing with Franco is he never played for a “good” Mets team until Benitez took over, then he became something of a PITA for the whole organization. 31. 29 We also had one of Julio Franco’s best years: career highs in HRs and RBI in a strike-shortened season. 32. I think the rule on DH should be a common-sense one. If a team has an All-Star whose real position is DH – Baines is probably the best example – then, by all mean, put him on the squad. But it shouldn’t be used just to sneak Don Mattingly on the Yankee team. 33. Screw Don Mattingly — the only chance Joe DiMaggio has of being on the Yankees team is as the DH. 34. 33 : Wasn’t Joe Dimaggio considered one of the better defensive centerfielders in baseball history? Or is this another myth? If the standard conception is correct, I’d think you’d want to move Mantle to DH (or to a corner spot) before you moved Joe D.
35. I would think Ruth would become the DH in the Yankee outfield. 36. Strange, nobody’s mentioned Lee Mazzilli. He probably doesn’t deserve to make the first team but Mazzilli was a decent player and I’d think that he would come closest to challenging Kranepool for the title of “Quintessential Met”. He was one of the few bright spots during the bleak years of the late 70s and early 80s and he came back just in time to contribute to the ’86 title. 37. 33 – CF for the Yankees is tough because they have two players who were a) career Yankees and b) considered to be among the best ever at that position plus a couple other guys (Combs, Murcer) that would make the first team for a lot of the other franchises. DiMaggio was among the best defensive outfielders ever and I’ve never heard anyone suggest otherwise. Everybody that watched him play said he was amazing and more recent statistical analysis backs that up. So Mantle gets pushed to DH because if you had both Mantle and DiMaggio on the same team, you move Mantle…which is exactly what Casey Stengel did in 1951 when he had both players. Mantle played right field that year and only moved to center following DiMaggio’s retirement. 38. To solve the Ted Williams/Joe D arguments, maybe you should limit the players to the expansion era. Just doing the math, you would have to be around 75 years old to see the old timers play in their primes. I don’t think many septuagenarians are posting to blogs. This will also be fairer to the integration of baseball around the same time. 39. 33 I’m not all that committed to left-right-center distinctions in the outfield, as long as you don’t have (say) Greg Luzinski in center field. In this case, you have an outfield of Mantle-Dimaggio-Ruth, sort out the positions.